Irish Record 3lb 1oz, taken on 21.09.1967 by Brendan Walsh at Rosslare Bay. Grey Gurnard are the smallest of our three main species that anglers will run into on their travels. This species has a white under-belly and flanks, leading onto a gold, bronze or light brown-pink back. Colours vary from one venue to another. To confuse matters, sometimes the Grey can be mostly pink-red in colour, but un-like the other two species, its pectoral fins are the smallest. The lateral line is made up from rigid, prominent scales. As with all Gurnards, the front “feelers” under the throat are used to dab the sand looking for small crustaceans and Sand eels. 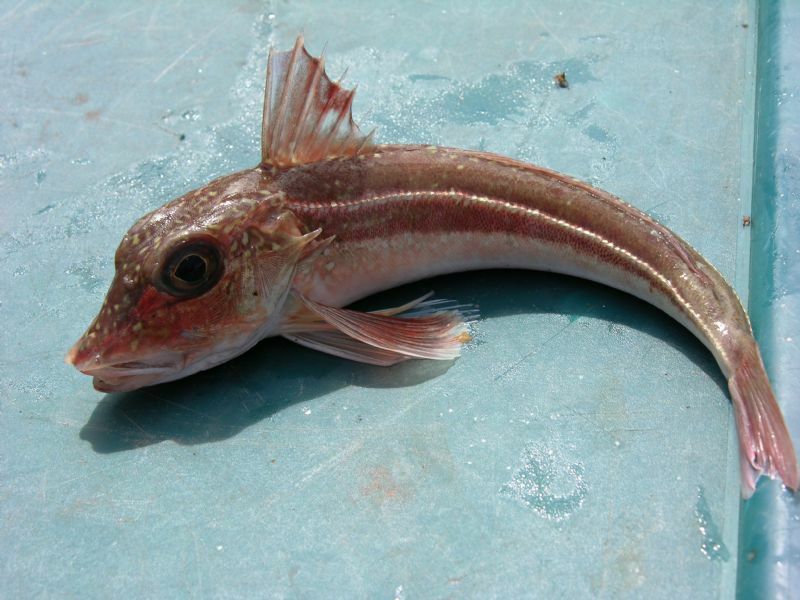 As with the Tub Gurnard and Red Gurnard, "Greys" are widespread around the Irish coastline, and are quite common, although fish of specimen size or over are considered exceptional. They are an interesting species to catch, but offer no fighting qualities and rarely exceed one pound in weight. They hunt over the same terrain as their cousins, preferring sand and broken shell leading onto patchy or “reefy” broken ground. If you fancy targeting a specimen Grey Gurnard, Sheep-Haven Bay out of Downings and also Port-na-blagh on the North Donegal coast would offer a reasonable opportunity. I was lucky enough to catch my specimen out of Bunagee Harbour, Culdaff. There are many Gurnard here, and it is a numbers game to find a larger fish. Belmullet in County Mayo on the west coast produces the occasional specimen and Dun Laoghaire on the east coast has recorded many specimens in recent years. The amazing Cork Harbour, as always, offers a very good chance of finding a specimen. Boat angling offers the best chance, but a few fish turn up for shore anglers, especially from headlands into deeper water over sand. Grey Gurnard can be caught most of the year but July through to the end of September would be the peak season to target larger specimens. Small strips of Mackerel or Squid are excellent and Ragworm, Lugworm or Sand eel are readily accepted. Ragworm tipped with a long thin belly strip of Mackerel is devastating. I also discovered that "Greys" have a particular fondness for white Ragworm, which is handy to know if you are fishing species competitions. Most baited Paternoster traces will work, although the Mustad shrimp rig can be deadly. My favourite Grey Gurnard trace consists of one hook about 18" above the weight, and two hooks a couple of feet below the weight attached to a boom. A couple of beads and small spoons as attractors and size 1 hooks complete the rig. Over the years, I have noticed that baited hooks above the lead weight seem to target more “greys” than “reds”. I always wondered about this until I watched them in “Exploris”, a local sea aquarium. The greys tend to naturally swim a foot or so above the sea bed, whereas the reds were content scurrying along the bottom. Interestingly, they are able to “grunt” as a means of communication, something that is quite audible whilst un-hooking or handling a Gurnard. I stored several in a tub of water aboard my boat, and we could hear them continually grunting away for the entire duration until I finally released them. Possibly why rattle chambers and spoons that vibrate work so well in deep water.